FORT WORTH, Texas–February 11, 2019–(BUSINESS WIRE)–Pegasus Resources, LLC (Pegasus), a mineral and royalty company based in Fort Worth, Texas, announced today that it has secured an additional $300 million equity commitment from EnCap Investments L.P. (EnCap), bringing EnCap’s total commitment to $600 million. Pegasus received an initial commitment of $300 million from EnCap in November 2017. The company is focused on the acquisition and management of mineral and royalty properties in the core of the Delaware and Midland Basins. Pegasus Resources is a mineral and royalty company based in Fort Worth, Texas, focused on the acquisition and management of properties primarily located in the Permian Basin. Pegasus is financially backed by a $600 million equity commitment from EnCap Investments L.P. Since 1988, EnCap Investments has been the leading provider of venture capital to the independent sector of the U.S. oil and gas industry. 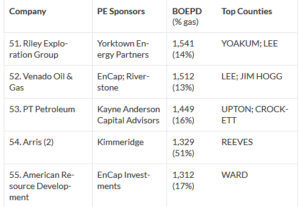 The firm has raised 21 institutional oil and gas investment funds totaling approximately $37 billion and currently manages capital on behalf of more than 350 U.S. and international investors.